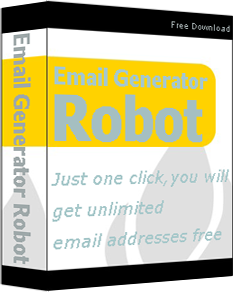 Email Generator Robot is a bulk email address generate software. This tool make email list based on user-defined keywords, not randomly generate, so the success rate is very high. You can get mass email IDs in really short time just one click. Now more and more webmasters, bloggers and affiliate using this software increase their income. Most of them have been successful. Lots of people create their email account by first name, surname, age, and other keywords. This software is according to this rule, search email addresses from mail server. The first thing you need to do is import the country targeted name lists from your computer. You also can use the name database that comes along with the application, which includes about 100,000 entries. If you need more names, you can search them in search engine, it's very simple. The second step is input the keywords as the prefix and suffix. This is optional. By entering different keywords, you will get more and more email addresses. The third step is select the email domain names. The program support some of the well-known email services, such as hotmail, yahoo, gmail, msn, aol. Using the well-know email services will increase the success rate. However, you also can input other domain names yourself. After complete the three steps above, just one click, the email addresses will automatically save to your computer. The Database include about 100k name list, if you need more name list, you can import them from your computer. Email Generator Robot support all text document, such as .txt, .csv, .xls, .doc, .xml,etc. The software will automatically remove duplicate names from your list, and you can select multiple files one time. Email Generator Robot is a high-speed, multiple-threads software. You can easily get unlimited email list in short time, everything is automatic, and it will automatically remove duplicate email list. If you want to get more emails, you just need input more keywords and domains. If the mailing list is huge, Email Generator Robot support export email address to multiple files, you can specified the number of emails per file. In general, you need generate a large email list, it will need spend more time. So you can set Email Generator Robot run in the background, and it will not affect you to do something else. Below is some email lists using this software generated. I spent $500 bought 100k email list last year, using this software, I can easily get 100 million email addresses in 20 minutes. It's really a nice email address generate program. Usually, I use an email spider software to collect emails, then import them to my fb account. However, this method is very slow if you want to get bulk emails, I start looking for other tools. When I found this email generator tool, I am really shocked. This is a fast email address creator, I can got a lot of email account in a very short time. This tool can produce unlimited amounts of targeted email addresses in seconds, accept hotmail,gmail,yahoo,msn,aol... You can use them for anything you can think, such as affiliate program, CPA offers, or other services. You also can add thousands fans or friends on social website from these email lists. I have used this software, and it really a top notch quality tool, perfect speed, and using is very simple. If you hope get numerous email ids quickly, I recommend you try this application. When you got bulk email lists, you can start your online business. You can use them do anything you can think. Selling email related product/service on your website, you can easily build your own website using some freeware program, such as Wordpress. Selling email related products on the third-party platform, such as eBay, Fiverr. Import these email addresses to your social media account, increase the number of your fans. Copyright @ 2012-2019 Email-Generator.org. All Rights Reserved.